Believing in its social responsibility towards Egyptian society; NMEG-HR is pleased to announce NISSAN Motor Egypt Internship Program “NMEG-IP” for the years of (2013-2014), Through NMEG-IP, Nissan will support Internships for undergraduates approaching the end of their studies (students who are currently in their final and pre-final year of study) in the different company departments. This program represents an exceptional opportunity for the undergraduates for practical training, learning and gaining experience which isn’t offered during study stages, in addition to giving direct supervisors the opportunity to assess trainees’ technical and personal competencies, and explore their adaptation with Nissan culture and work environment for future recruitment in NMEG/DE. 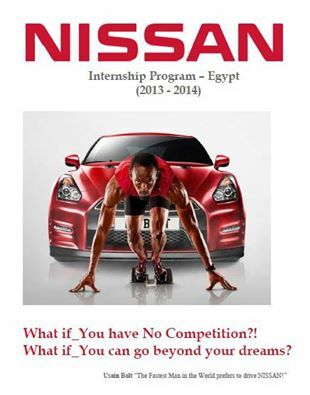 If you want to promote NISSAN Motor Egypt Internship Program “NMEGIP” to any candidate(s), kindly refer to the eligibility and admission requirements (below link). Candidates are requested to submit their applications and required documents to the NMEG - HR by July 14th, 2013. Please Note: Internship duration for each trainee depends on function request (3 Weeks to 2 Months).